Orthodox Christian Fellowship (OCF) is the official collegiate campus ministry program under the Assembly of Canonical Orthodox Bishops of the United States of America. OCF transforms the lives of college students in the United States and Canada by guiding them along the path to Jesus Christ through His Church, cultivating a campus community of worship, witness, service, fellowship and education. To inspire students to commit to living an Orthodox Christian way of life daily. Orthodox Christian Fellowship (OCF) has a rich history in North America that spans over 50 years. Following World War II, an Orthodox college student movement emerged. Individual campus groups formed at various universities, including Columbia, McGill, and Penn State, and—for the first time—Orthodoxy was being celebrated and shared on college campuses. In recognition of this, the Standing Conference of Canonical Orthodox Bishops in the America (SCOBA) formalized the Church’s campus work in the spring of 1965 by creating the Campus Commission to oversee and coordinate these developing local fellowships. James Couchell (now Bishop Dimitrios of the Greek Orthodox Archdiocese) was named OCF’s first Executive Director. Visiting colleges coast-to-coast, he established hundreds of campus chapters, launched the very popular quarterly magazine Concern and held annual retreats at St. Vladimir’s and Holy Cross seminaries (predecessors of our present-day College Conferences). In 1971, when James Couchell was re-assigned, Orthodox campus ministry unfortunately struggled and eventually closed. Despite this, the spirit and mission of OCF was kept alive by individual chapters across the country. Chapters continued to form and grow. In 2001, three seminarian classmates—Fr. Michael Nasser of the Antiochian Orthodox Archdiocese, Fr. Mark Leondis of the Greek Orthodox Archdiocese, and Fr. Michael Andersen of the Orthodox Church in America—recognized this natural growth and pledged to work together towards the resurgence of a pan-Orthodox campus ministry. With SCOBA’s blessing and Metropolitan Isaiah of the Greek Orthodox Metropolis of Denver as OCF’s overseer, OCF was reconstituted and structured as a collaborative Orthodox effort with jurisdictional representatives on the Board of Directors. This allowed the Church to maximize limited resources and be present on a greater number of colleges with relatively few Orthodox students on campus. With this blessing & direction, OCF was first housed at the Patriarch Athenagoras Orthodox Institute based on the campus of the University of California – Berkeley. This is where the process of building a chapter structure began. The North American Office then moved to the campus of Hellenic College/Holy Cross Greek Orthodox School of Theology in Brookline, MA and hired a full-time executive director. At this time, OCF received a portion of a Lilly Endowment grant awarded to Hellenic College for the Theological Exploration of Vocation. This five-year scaling grant enabled OCF to build an infrastructure, hire staff, and expand its programs. 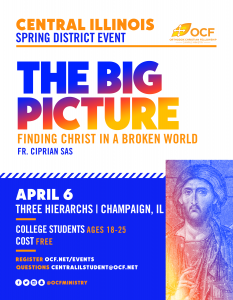 And the First Forty Days Initiative, designed to contact Orthodox students before they go to college and connect them to their new OCF chapter and local parish. These are only some of the many achievements OCF has been blessed to realize in such a short time. Presently, His Grace Bishop Gregory of Nyssa—of the American Carpatho-Russian Diocese of the U.S.A—serves as OCF’s Episcopal liaison to the Assembly. Jim Gianakis is the Chairperson of the Board (for more information, see Board of Directors or Staff). OCF is moving forward as strong as ever, developing and implementing a new organizational structure that puts the students and local chapter at the heart of OCF. Likewise, OCF is working to continuously improve in the areas of leadership training, high school to college transition, and college to parish transition through new and innovative programs as well as partnerships with other organizations in the Orthodox world. Most importantly, OCF continues to provide a home for students on college campuses across the continent—upholding the vision of its early founders and the mission established in 2000. With more chapters developing, the future of OCF is bright in its continued journey to glorify God by supporting His students. A native of Greenville, SC, born in 1938, Bishop Dimitrios (Couchell) of Xanthos attended Northwestern University and graduated from Holy Cross Greek Orthodox School of Theology in 1963. Following a year of studies at Yale Divinity School, he was employed in September 1964 to initiate a Campus Ministry program for the Greek Orthodox Archdiocese. This resulted in the establishment of the Campus Commission, under SCOBA in 1965, and the publication of “Concern” magazine, a quarterly for Orthodox Christian college students. He visited over 500 campuses during this period, establishing contact with several thousand Orthodox students and faculty, and more than 100 Orthodox Christian Fellowships. On behalf of the OCF’s, he joined and served on the Executive Committee of Syndesmos from 1971 to 1977, and was elected President in July 1977. In September 1971, he was appointed the first English Editor of the new bi-weekly newspaper of the Greek Orthodox Archdiocese, the “Orthodox Observer.” During this period, he served as an officer of the Orthodox Theological Society in America, on the Board of Directors of the Associated Church Press, and represented the Greek Orthodox Archdiocese in various capacities at the National Council of Churches of Christ. In May 1981, still a layman, Mr. Couchell was appointed Executive Director of the St. Photios Foundation in St. Augustine, FL, and was charged with competing and opening the St. Photios Greek Orthodox National Shrine. In 1983, Mr. Couchell was ordained to the holy diaconate by Bishop John in Charlotte, NC, and to the holy priesthood by Archbishop Iakovos, in St. Augustine. He was elevated to the rank of Archimandrite in 1985. In January 1985, the work of the Shrine expanded to include the mission work of the Archdiocese and in 1994,received the blessings of SCOBA, to form the Orthodox Christian Mission Center (OCMC). Fr. Couchell represented the OCMC on the Missions Committees of the National Council of Churches of Christ, and the World Council of Churches, as well as the Orthodox Advisory group of the World Council of Churches. Fr. Couchell served as the Founding Director of the OCMC and the St. Photios Shrine through August 1998. He was elected to the episcopacy by the Holy Synod of the Ecumenical Patriarchate on May 18, 1998, and was ordained as Bishop Dimitrios of Xanthos at St. George Cathedral, Philadelphia, PA, on Sunday, May 31, 1998, by Archbishop Spyridon. As an Auxiliary to the Archbishop, he assumed duties as Ecumenical Officer of the Archdiocese and General Secretary of SCOBA in September 1998. He served on the Governing Board of the National Council of Churches of Christ in the USA, the Board of Christian Churches Together, the Committee of Religious Leaders of New York City, the Council of Churches of the City of New York, the Board of the St. Catherine Foundation, the Board of Trustees of St. Vladimir’s Seminary, the Board of the American Bible Society, and continues to serve as co-chair of the SCOBA Joint Commission of Oriental and Eastern Orthodox Christians. Bishop Dimitrios retired from active serve in December 2007. In 2010, the OCF Board of Directors honored His Grace with the creation of the Bishop Dimitrios of Xanthos OCF Endowment Fund. If you would like to make a contribution to the fund, please click here.